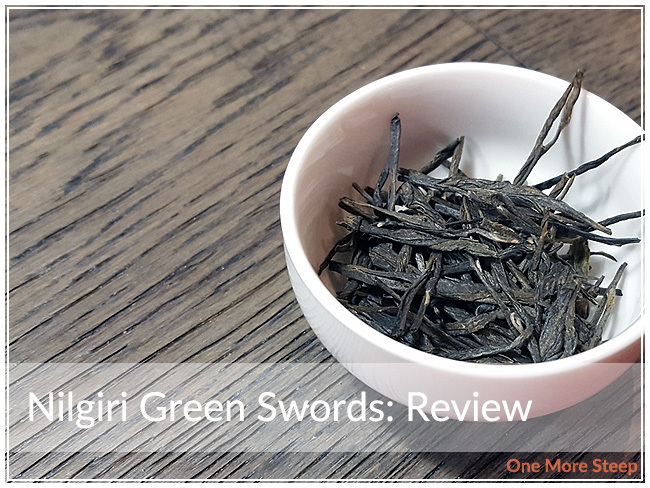 The dry leaf of Nilgiri Green Swords has an aroma that is an interesting mix – when I opened the packet (resealable kraft paper bag that’s lined in foil), I could smell grassy notes, along with what reminded me of apricots. The description of the tea on the packaging suggests that this tea tastes like peaches. 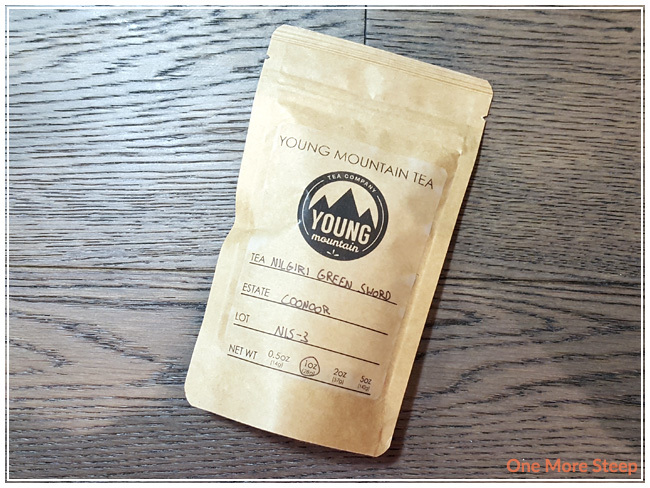 Young Mountain Tea recommends steeping Nilgiri Green Swords in 180°F (82°C) water for 3 to 5 minutes. I opted to do my initial steep of Nilgiri Green Swords at 175°F (79°C) for 3 minutes. The first steep of Nilgiri Green Swords steeps to a pale yellow, and it has a very subtle grassy aroma to it. The taste of this green tea has a light sweetness to it, and a mild vegetal base. While the description of the tea was peaches, I still taste apricots – so still some fruity flavour to it. 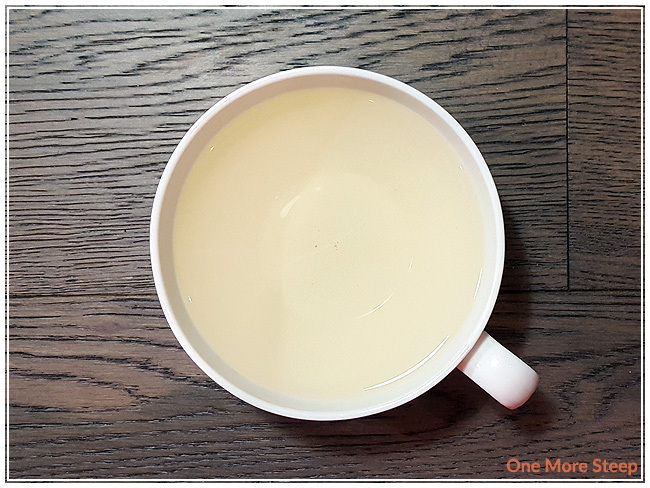 With the apricot comes a bit of sweetness, making this tea pleasant to drink. I did resteep Nilgiri Green Swords a few times (four resteeps total), adding an extra 30 seconds per steep. I found that the flavours became more developed – the apricot/fruit sweetness came through more with each steep, while the vegetal base remained mostly the same. The colour of this tea became more and more golden yellow with each steep. 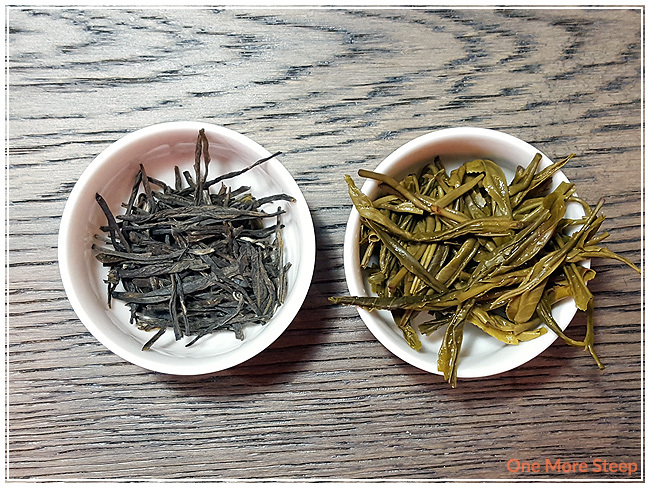 I liked Young Mountain Tea’s Nilgiri Green Swords. 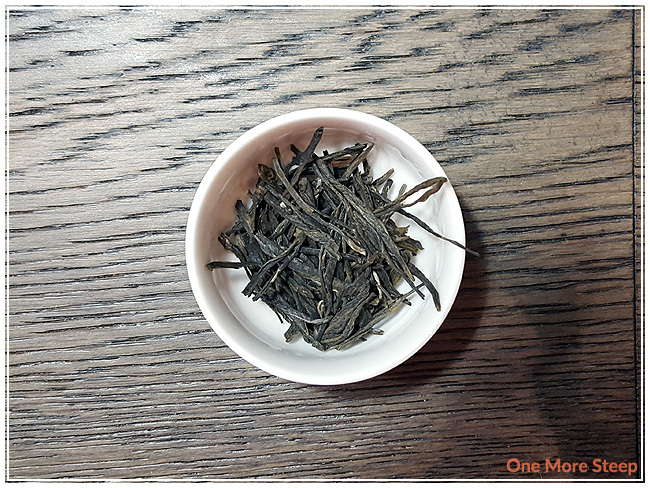 I found the flavour to be pleasant, and enjoyed the fact that the fruity flavour was present in this green tea. I wish it had reminded me more of peaches, but the apricot flavour that I was able to pick out was delicious and balanced well with the vegetal flavour component of this green tea’s flavour. I think it did well with the resteeping process, and enjoyed watching the tea leaves open up. It’d be a nice tea to pair with a slice of pie or other sweets that lean towards the savoury side. Glad to hear the tea was well received, and very interesting to note that it evoked apricots more than peaches. The producer just opened a new factory with significantly upgraded equipment, we’ll be checking it out next week and plan to bring on more of his teas in the coming months. Would love your thoughts on these new teas once we have them!